She was retired from the Adair County School System, working last in the lunchroom at John Adair Middle School. She was a member of Freedom Separate Baptist Church. She was the widow of the late Leslie Sinclair, Jr., who prececded her in death on November 14, 2014. She was the matriarch of a highly respected East Adair County family. She leaves five direct living descendants. Thelma Jean Sinclair, 84, of Columbia, Kentucky, died Monday, May 14, 2018 at the home of her daughter. Funeral service will be Saturday, May 19, 2018 at 11amCT at Grissom-Martin Funeral Home with Bro. Troy Grider and Bro. Darren Blair officiating. Burial will be in Freedom Cemetery. Visitation is after 4pmCT Friday. Thelma Jean Sinclair was born February 9, 1934 in Russell County, KY to Clarence and Gusta Sullivan Smith. She died Monday, May 14, 2018 at the age of 84 years, three months, and five days. In addition to her parents, she was preceded in death by her husband, Leslie Sinclair, Jr., on November 14, 2014. 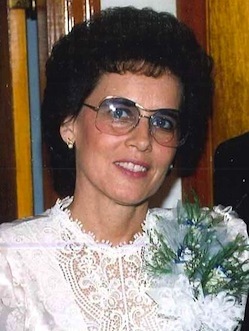 She was a member of Freedom Separate Baptist Church and retired from the Adair County School System, working last in the lunchroom at John Adair School. 2018-05-15 - Photo from the family collection.